We all hate online surveys right? Well, Who doesn’t? When we see these surveys online then we just try to find a way to survey bypass online so we can download the desired third-party app on our Device. Online Surveys are one of the most irritating things in the online world after the popup ads. In the online world, we often face surveys while trying to download a third party software or application. However completing the survey becomes a hectic task, most of the surveys ask you to install an extension on your browser or ask you to install a third party software on your Computer. But some people don’t like this hence they look for some tricks to Survey Bypass Online or they search online for survey bypasser download. Just in case if you are too wondering how can you bypass or Skip surveys then I’m here to help you out. As you read further in this article we will be sharing some of the top tricks and tips to bypass survey Online on Windows computers. So let’s just head into the topic without wasting much time. If you are an Android user then you can learn these 5 tricks to bypass Survey Android. I know many users searches online to skip survey for downloading the files from a website and you would be one of them who searches for a term like Online survey remover or survey bypass tool. Well, I have the solution for all your queries related to survey bypass online, so let’s get started one by one. If you are a heavy internet user then you might know about Mozilla Firefox. Also, if you don’t know what it is then in simple words Mozilla Firefox is a browser. So for our first trick to bypass survey online on windows you have to download the Mozilla Firefox browser on your computer and install it. Once you are done with the installation process then you have to add an addon on Mozilla named as the NoScript Security Suite. This is one of the famous survey bypass tools for windows users. So make sure you check it out. 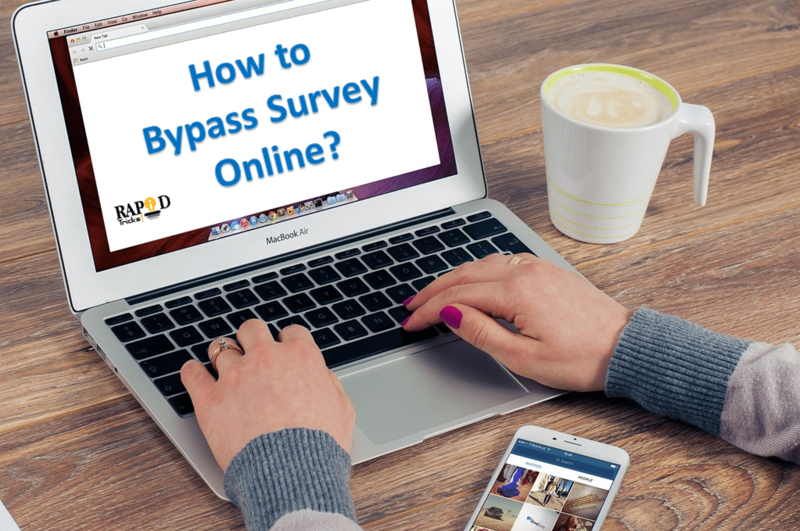 Follow the steps given below to know the complete trick to survey bypass online. First of all download Mozilla Firefox Browser on your PC from here. Now install an addon called NoScript Security Suite on Mozilla FireFox from this link. Once installed successfully, just activate it and you are good to go. The addon is very helpful and you should enable it while surfing the internet and also it will bypass survey online on any website easily. Just in case if you are a Google Chrome users and do not want to try out the Mozilla Extension. Then you can try out the Auto Overlay Remover extension. It is also one of the popular Google Chrome survey bypass tool windows users are using. In order to download the extension, you can visit the Chrome web store and search for the extension and you are good to go. First of all, if you dont have Google Chrome Browser on your PC then download it from here. Now install and activate the Auto Overlay Remover extension on Google Chrome. Once you have successfully done, then you can easily bypass surveys Online on any site. Then Go to the Settings. You can find the settings button in the menu which is at the top right of the Google Chrome. Now here look at the Advanced System Settings. XJZ Survey Remover is another great survey bypass tool windows users are using. All you have to do is download the application from the official website and install the application. Once installed it will take care of all the survey blockings. You can Download XJZ Survey Remover Tool From here. You can download Surveys Remover tool in order to Bypass survey on windows. Just visit the official website and look for the secret method to bypass online survey. They will ask you to like your site and when you like it you can download the pdf file in which they have explained the full 100% working tricks to bypass survey online. Here I am going to provide you the step by step process to survey Bypass online using survey remover tool. Just open this link on your Windows PC or MAC or any device that you are using. Now click on See Method button. Here you will see Facebook Page Like button on their site, just like it and download the pdf guide. Once download, open the PDF and learn the simple steps to remove online survey or bypass survey online on any site. That’s it! Now you can download your favorite apps or software without completing any annoying survey. So that was all, for the Top Tricks To Survey Bypass online on Windows PC. Just try each of them one by one and see which trick is working for you. Also, if you have any questions do comment below in comments section. I’d be more than happy to answer your queries. And if you like this article then dont get shy to click any of the share buttons to share this post on social media channels with your friend’s circle.